Well, it’s after midnight and I’ve written nary a word. I call on thee, O Magic Biloba of Gingko, to assist with wordiness. But, that doesn’t mean I haven’t been working on this very grand occasion. It is, as you may know, the 100th day of my blog which is called, as you may know, ‘100 Days, 100 Ties’, and I have spent a big part of the day preparing for the week that will be. 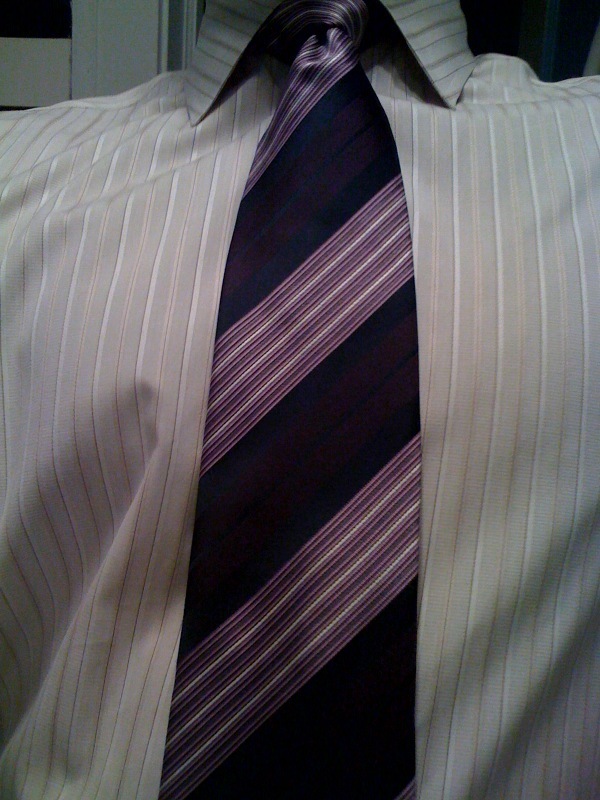 No, Purple Tie Week doesn’t take any particular massaging…I picked out my 7 or 8 remaining purple ties, chose 4 that seemed to have the most purple in them (and not just purple decor) and voila. Believe me, Ugly Tie Week will be much harder. But, since I knew that, for the Century Tie, aka Tie No. 100 (Tie C, for the Roman numerators out there), I wanted to do a few things a bit special. I’ve mentioned the Ties For ChariTIES, where I am trying to raise some money this week for the Salvation Army and Evanston Community Foundation, by taking photos of People, or Philanthropists, With Ties (PWT). Man, Woman, Tall, Short, Young, Old…you, too, can be in the 100th TieDay celebration. If there’s a small chance that I’ll happen to run into you, just email me a picture of you and your loved ones sporting a tie. To that end, I packed about 8-10 ties (from the Previously Worn collection), pre-tied in knots for ease of donning. I didn’t want my pix this week to be only for those who wear them to work, but for someone with the guts to care little about tie/shirt color coordination, as well as care for local charities. I ended up with, by my wonky count, 19 pics of PWT (People With Ties), well on my way to my goal of 100-plus. But first, my Tie du Jour. It’s a Giorgio Armani. It’s an Armani. Not many ties (or suits) carry cachet such as this. Oozes high class. Even the Armani tag on the back of the tie is a bit upper-catwalk. It was a birthday gift, and immediately I felt happy not only at the opening of the wrapping, but I felt at one with the selection process. Had I been the one shopping for myself, it is the tie I would have chosen, whether there were 10 or 1,000 ties on the table. I mean, just tying the thing is an experience in itself. You tie it right, and a piece of the brighter stripe shows up on the knot. I am positive this was planned, and they knew exactly where to cut. Ok, as I mentioned before, I took about 19 PWT pix, and getting them all squared away right now and placed properly on the blogspace is too daunting for me right now. I will add some very special tie-sporters, though. Their individual pix will go up starting tomorrow, with the rest of the generous crew. 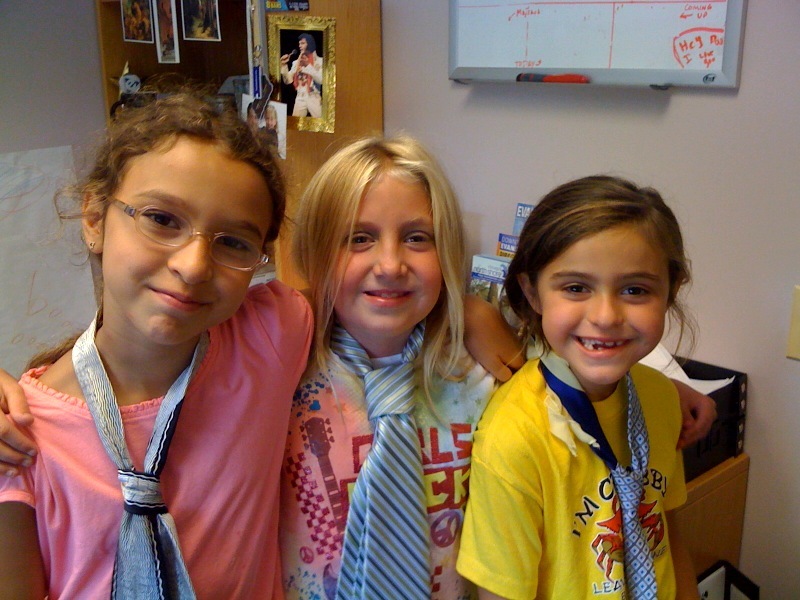 This entry was posted on August 11, 2010 at 1:23 am and is filed under Girls With Ties, Guys With Ties, Purple Tie Week, Tie du Jour. You can follow any responses to this entry through the RSS 2.0 feed. You can leave a response, or trackback from your own site.